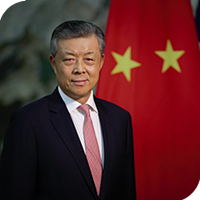 "China’s View of the World"
His Excellency Liu Xiaoming is a career diplomat who joined the Chinese Foreign Service in 1974 after graduating from Dalian University of Foreign Languages, China. He also earned a Master's degree in international relations from the Fletcher School of Law and Diplomacy, Tufts University, U.S.A. in 1983. During his career he has worked in the Ministry of Foreign Affairs (MoFA) and China’s embassies around the world. After three years in Zambia and four years at MoFA he studied at Tufts University and, on his return to China, spent six years as Deputy Director of the Division of U.S. Affairs. Between 1989 and 1993 he served at China’s embassy in the United States of America. Between 1993 and 1998 Liu's roles included Deputy Director-General of the Department of North American and Oceanian Affairs. Then, after three more years at China’s Embassy in the U.S.A. he was appointed Ambassador to the Arab Republic of Egypt. There followed appointments in Gansu Province and Beijing until in 2006 he became Ambassador to the Democratic People's Republic of Korea. In 2009 he moved to London to take up his current role as Ambassador to the United Kingdom. His honours include The Fletcher Dean's Medal, Tufts University, the First Class Friendship Medal (Democratic People's Republic of Korea), and Fletcher Class of 1947 Memorial Award.